Allumette opened earlier this year, in what was a quick re-conceptualization of Echo Park’s Allston Yacht Club. Young chef Miles Thompson, formerly of Son of a Gun, brought his pop-up The Vagrancy Project to AYC last summer. It sounded like a successful run and I’d heard much about it, but never got the chance to attend one of those dinners. However Thompson wasn’t going very far – he became the executive chef of Allumette. 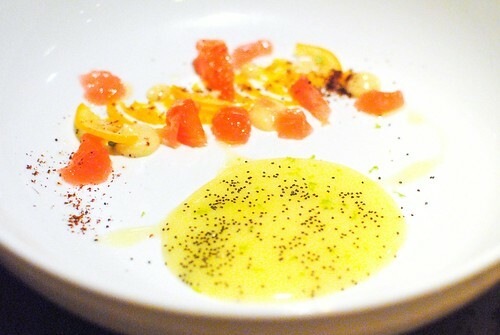 The menu is small plates-based, split into a few dishes each of vegetables, pasta, fish, shellfish, meats and for sharing. The portions are small enough to create a customized tasting menu, but most were substantial enough to share (like we did). I was invited to come have a taste of the new restaurant and was excited to experience some of the young chef’s cooking. 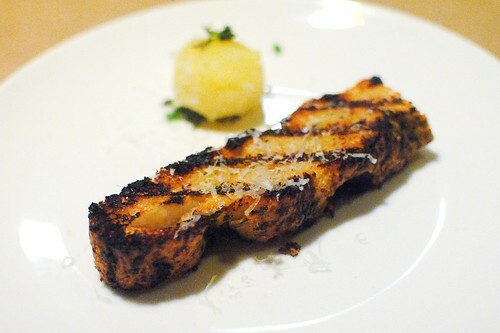 The meal began with a warm, buttery and crusty slice of foccccia. An easily spreadable cheesy-potato creation was a comforting and ideal accompaniment to the bread; fresh rosemary perfumed each bite. 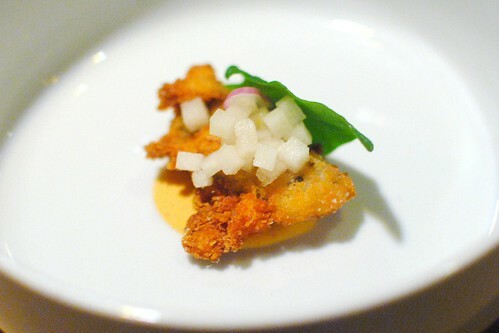 I was eagerly anticipating this dish (what’s not to love about fried oysters? ); I thought the oyster was fried just a touch more than my liking, but it was still a very good two bites. Asian pears provided a nice sweet freshness to cut through the fried batter. 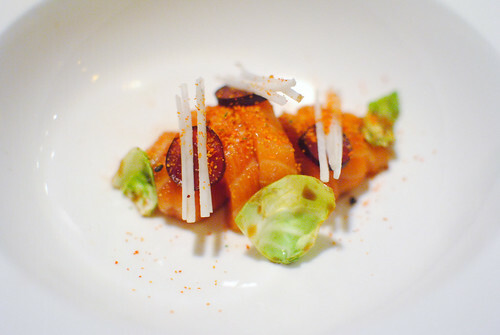 I found the subtle flavor of the trout to be a bit overwhelmed by the togarashi spice. Some pickled grapes and yuzu ponzu provided some acidity to balance, but I was still missing the fish. Shima-aji was a delicate, tender fish, and I enjoyed the savory/spicy misture of the mustard miso and sweet kiwi. Rice crackers provided a bit of crunch here. 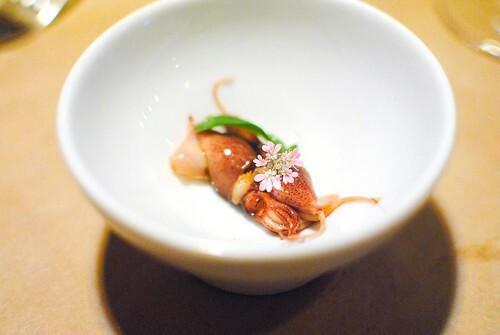 At this point in the meal, we were served an intermezzo of fairy squid marinated in a lime ponzu. The squid provided the right amount of chewy bite to go along with a light and refreshing lime ponzu marinade. I really enjoyed this one. This Hokkaido scallop was a new addition to the menu. 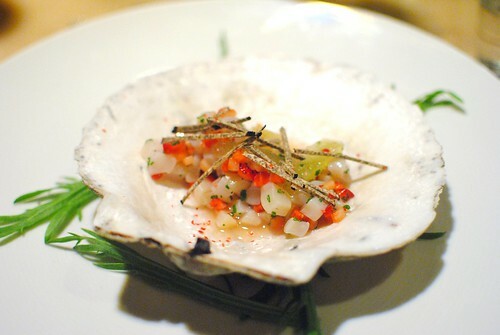 I liked the scallop itself but found the strawberries to be a little strong at times, overwhelming the subtle flavors. A duo of salads came out next. 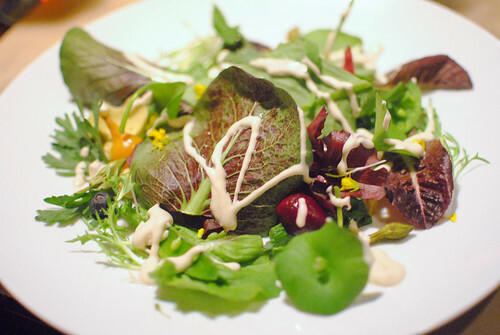 The first dish, a plate of greens with creamy avocado and crunchy macadamia, was highlighted by a very interesting smokey soy cream dressing. 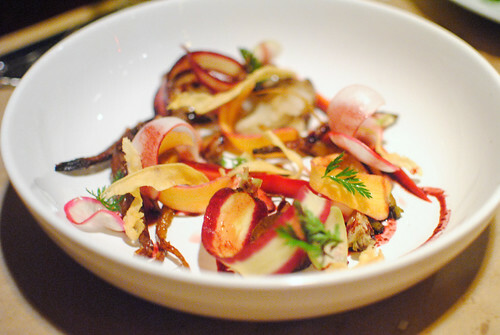 The other salad, a mix of crunchy shaved root vegetables, had crisp flavors and refreshing tart undertones. 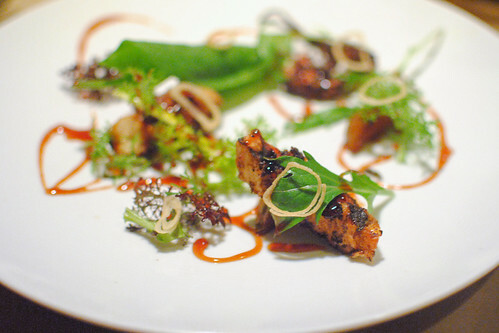 We moved back into the warm dishes with this grilled octopus, drizzled with a sour apple syrup. A little bit sweet, a little bit sour. A hearty piece of pork shoulder was next, luscious and rich. 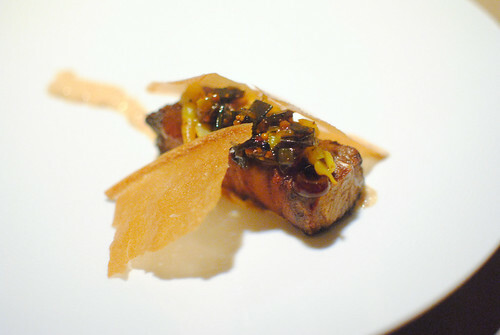 It had a deep porky flavor, complemented by sweet caramelized onions and a crispy feuille de brick. 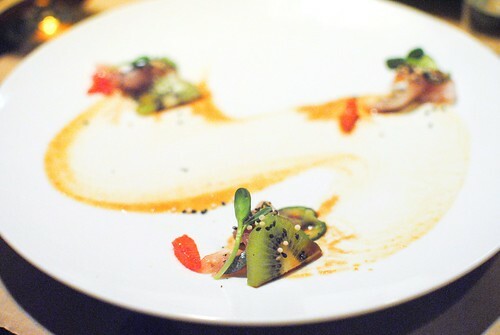 I really liked this dish. 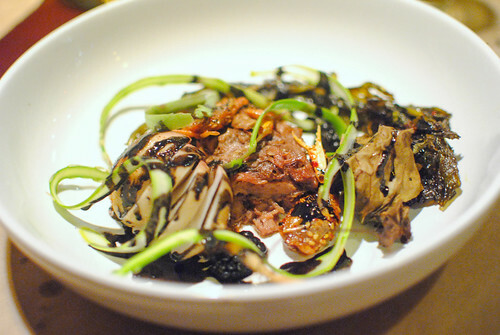 The lamb neck terrine was delicious and tender, showing off great lamb flavor without being gamey. Baby soft shell crab, marinated in Korean chilies, added a bit of heat while shaved cucumber and turnips provided some starchy compliments. This was another highlight, starting with a really nice chewy dumpling wrap. Juicy pork was brightened by salty salmon roe and candied citrus peel; black vinegar provided just a little acid to cut through the richness. 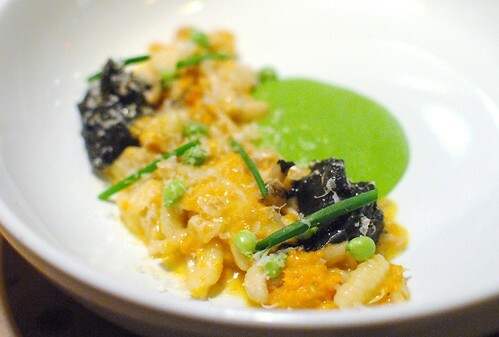 I really liked this one as well, featuring al dente pasta in a delicious warm sea urchin ragu. The English pea puree was excellent too, showcasing its sweetness and mild earthiness…creating a soft of surf-and-turf effect. 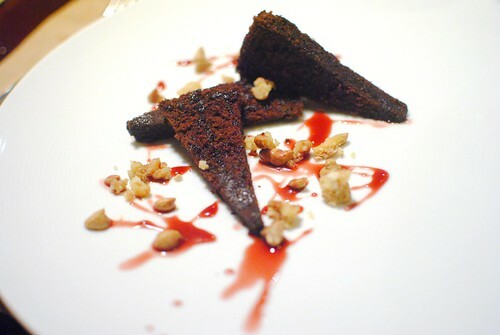 Upon finishing the savory courses, we tried each of the desserts. The unanimous favorite was the cheesecake mousse. 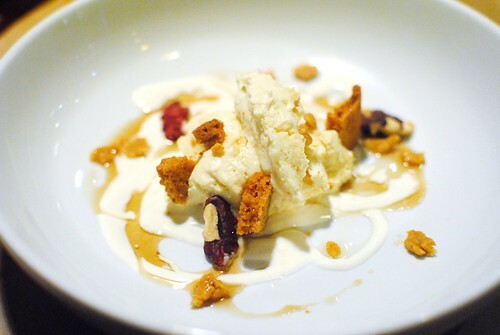 The rich and smooth creation, with crunchy pieces of frozen cookie dough and walnuts, was a hit. The citrus curd was a bit too tart for my liking, but I appreciated its bright, fresh flavor and showcase of what’s available at the market. 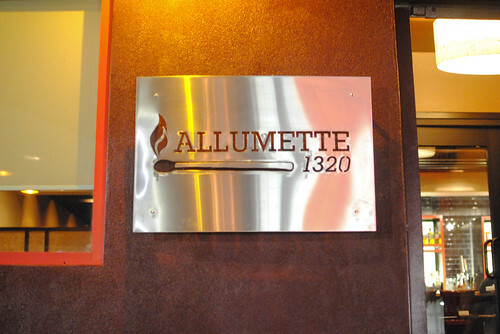 I didn’t love Allumette, but I enjoyed the meal. Thompson is cooking a pretty ambitious menu (maybe the most ambitious in Echo Park, ever) and for the most part it works. I think he showed a lot of promise, and I found a comfort zone in many of the composed cooked plates (lamb neck, pork dumpling, cavatelli). 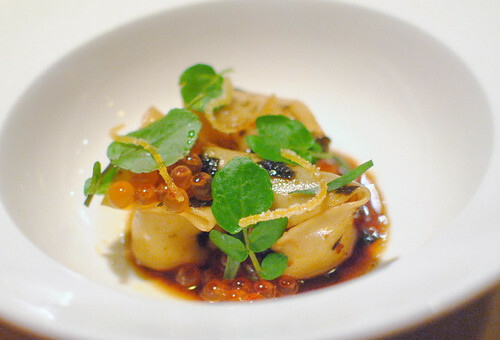 Given its proximity to me in downtown I’d return to see how the chef and his menu evolves.